Soon The City will have it's second roundabout. The first is in the northwest part of the city on Career Ave near University Center. The second is planned for '09 & '10 construction at the convergence of 69th @ Southeastern. I caught up on the "How We Drive" blog and found two contrasting videos. Enjoy. Cyclists - do you remain alert when stopped at red lights? Imagine being one of the pedestrians in the picture. Don't be too fooled. The roundabout is clearly not playing in real time. Obviously there is no crash in the roundabout BUT - crashes in roundabouts tend to be angular, reducing the amount of damage and the likelyhood of injury and death. Roundabouts - learn them - enjoy them - ask for more of them. Please. DW @ CycleSD was wide awake today; first with the news that there's an effort in our neighboring state of Iowa to get bicycles off the highways and on to multi-use paths. DW e-mailed the group and received this in return: "This is for the state of Iowa only. The statistics are in upwards of 500/year last year alone 5 fatalities, and not only does this affect the bicyclists involved but also the motorist and their families the rest of their lives. We are not haters of bicycles and this is not just farmer oriented its about change for everyday citizens in the state of Iowa. 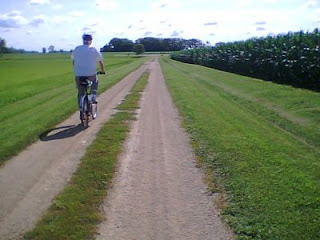 Classified as a vehicle or not, we do not believe bicycles belong on our farm-to-market roadways." Anybody here ever been to Iowa on their bike? Here is a statement from the Iowa Bicycle Coalition. Makes me wonder what would happen if a similar attempt were to occur in South Dakota. 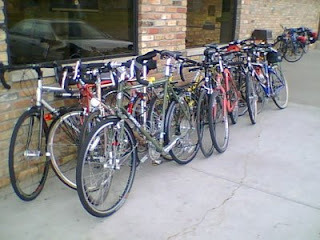 Are South Dakota cyclists organized enough to defend their right to ride on the road? Curiously the petition is hosted by Care2 a site where a person can "join the largest online community of people making a difference in healthy and green living..." I guess healthy is in the eye of the beholder and green living must have something to do with money. "Diez pulled a gun and opened fire..."
"...hitting the victim in his bicycle helmet, according to police." An alert Friend of The MinusCar Project pointed me to an article from Asheville, NC that contained these words. Any guesses on whether the helmet was able to stop the bullet? The setting of the story is a motorist upset because he encountered a father with his young child moving at human speed in a busy roadway tunnel. Nothing a small amount of gunplay can't fix, right? Sounds like the interns at The Sioux Falls Green Project had some new experiences by bicycle last week. Sorry about that. Hydroplane Crash: Driver Walks Away! I first saw this on a walk by TV Foxnews report: Hydroplane crash, driver walks away. That sounds pretty remarkable. I hope there's video. Then I saw in this article "Driver J. Michael Kelly made it out of the escape hatch and in his words, 'Pretty much walked away unscratched.'" REALLY! Now I must find out more. A hydroplane crash that the driver walks away from. Surely this news is all over the internets! Turns out there aren't very many articles. And those that do exist are exclusively focused on the crash and its lack of injury. There's hardly any information about how he exited the boat and walked away. Unbelievable. Even this video is cut in such a manner that you can't see him walking away. Seems like the mass media never gets the important parts of the story. KELO did a follow-up piece. The story from the cyclists side. I'm pretty happy with this. Yep the kid came out of nowhere, pretty much SOP for bicycle collisions. Does anybody ever say, yeah, I saw him the whole way and just smacked him for being there. Yep, there are lots of dangers on the path that even the experienced cyclists don't realize. Yep, cyclists should take more care. Huge props to rider Jerry Kraus for his excellent TV skills. Not a single 'uhhhhh'...how'd he do that? And the content. Golden. So, which one of you commenters will ask The City if they're ready now to build some proper singletrack to lessen traffic on the unsanctioned dirt that played such a direct role in this collision? A 5-year-old boy got smacked down on the MUP Sunday afternoon. Collarbone broken - which is relatively good. 5-year-olds heal fast. The news report even shows the kid riding the same day. Mom: "No sense having anybody bark at you to move or get going. We're just down there to enjoy ourselves, not to have it as a racetrack." 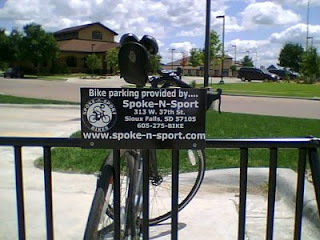 The Spoke-n-Sport Criterium's are the second Thursday of the month. If that's not frequent enough to satisfy your hankering for pedaling in anger then you get into planning meetings, volunteer or arrange your own, so that they're more frequent. My The Family was out there too. Our bad experience with the 20mph set ended much cleaner. Seems to me if a guy finds himself saying "there's plenty of room" it actually means he's sensing that there's not. Especially when the lead dude (FAB Jersey - when can we meet?) is forcing an oncoming bicycle off the trail because he can't look beyond the end of his nose to see his way through the curvy parts of the trail. It's like driving a car. You look ahead. If nobody's coming you pass. If somebody's coming you take your place in line and wait for clearance. If there's a five year old you pass with extra care because those dudes are very unpredictable - this is still fun for them - and you compliment his Huffy and his helmet on the way by. Or is it like driving a car...if you have to move your foot from the accelerator to the brake you cry and whine and say something out your cage hole about finding some other place to ride. The espresso milkshake @ Coffea is excellent. The bike parking fabulous. So this is how you boys do it up there in the big city. 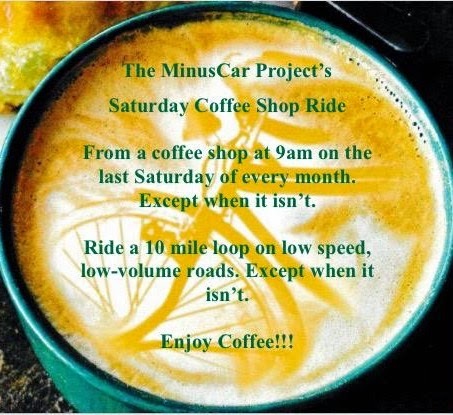 MinusCar Minneapolis correspondent KT highlighted this article in the StarTrib. "Cyclist arrested while training for naked bike race, police say"
"A Minneapolis man who was cited Thursday for indecent exposure told officers that he was training for a naked bicycle race, police said. Johann Scott Scrimshire, 42, was arrested about 6 a.m. near Calhoun Parkway..."
Fair enough I suppose. Races like this must exist. "It clearly looked intentional," [Sgt. William Palmer] said. As opposed to riding like that accidentally? I'm just hoping Scrimshire doesn't rent bicycles from Calhoun Cycle. I didn't accomplish as much today as I did last time I posted about being "too busy to ride." The day began with some careful planning. In the messenger bag went work clothes, workout clothes, post-work meeting clothes, and post-meeting club ride clothes. True, it takes some deliberate planning to pull this kind of thing off. I made a game time decision to cancel the workout after a some work meeting schedule encroachment. Bonus that the workout clothes go into the desk then. I don't have to carry them home (wet) and I don't have to carry them to work next time. #1 - 4,800,000 miles are driven in Sioux Falls everyday. #2 - is the punch line. Read to the end. Two hours later arrive at Nutty's, where the nuts are, and enjoy a Fat Tire Ale and some peanuts to (fuel up for the coming ride) honor the departure of a good friend from work. The good turn out of current and former workmates indicate she's a good friend to many. Depart there and head over to FAB's Wandering Wednesday Ride. Rode with The Owner and the leader and another. I don't ride in groups very often but I always leave group rides remembering how fun it is. Post ride meal with The Owner. After filling up with 'Doba Ancho Chile BBQ Burrito he was in no condition to decline my request to drive me the remainder of the way home. It was a 44 mile day for me. In the CAC meeting I learned that 22,000 hours are spent each day on Sioux Falls roadways idling. Sitting there. Buring gas. Making no progress. So there it is...I simply don't have time to drive. I'm surprised at how much time they had on the mountain. I supposed security had to be very careful once they realized they'd been breached. I met the dainty smelling fellas at Caribou again tonight. We talked singletrack and agreed we're ready to put our dog and pony show up for park's approval. I'm not saying who's the dog and who's the pony. On the way to the meeting I checked out 12th & Main. Last week I reported my bicycle left on red to the city. Today I noticed it's up and now serving left turns even to bicycles. I also rolled through 26th and Center and noticed it has been improved. An automobile shared the intersection with me so I was unable to confirm its bicycle only functionality. As noted in an earlier comment The Owner indicates the 37th and Minnesota Ave received attention this week. It's still true - if you make your streets more bike friendly then your streets will be more bike friendly. I invite other local cyclists to play along. First you must ride your bicycle in the city. Next, ride enough to identify an intersection where the light won't change for bicycles. Finally report it here on the city's website. I wonder how long it will take to get that spray painted q-tip thing changed to something along the lines of this. Does Your Traffic Engineer Know You're There? It's the law: "Every person driving a bicycle shall have all of the rights and all the duties applicable to the driver of any other vehicle by this Code..."
I assume vehicle drivers have a right to expect functioning traffic control devices. I assume The City is breaking the law with their prevalent use of vehicle sensors at intersections that fail to detect bicycles. I assume The City contributes to the behavior problem of red light running cyclists by systematically failing to acknowledge their presence at intersections. I assume the behavior problem of red light running cyclists contributes to the behavior problem of red light running motorists. ...of which there have been more than 8 a day in 2009 at our famously camera monitored intersection. Saturday I noted improved vehicle sensors at 18th & Southeastern Drive. Thank you. Wednesday I attempted a legal left turn with my bicycle off 12th Street to the south bound sharrow on Main Ave. The vehicle sensor failed to detect my presence. I was unable to identify the sensor placement in the roadway. In this situation the police department recommends a right turn and alternate route. I was in the left turn lane and a right turn would have me going the wrong way on a one-way street. I chose to break one law instead of two and performed a left turn against the red light. Please consider placement indicators for vehicles that aren’t automobiles at this intersection. In addition to the paint (which is temporary) the sensitivity of the detection device has been increased (which is not necessarily permanent). In the text below there's a quote attributed to Karl Marx. I'll give $10 to the first person to prove the source truly is Karl Marx. The quote can also be found on this Tea Party page ostensibly written by a "Dr. Allen Unrue." Today there was a Tea Party on Socialized Medicine at the fairgrounds. Details can be found here - http://www.teapartysd.com/. Their press release indicates they expected 8,000 to 10,000 folks. I must say I really appreciate the even handed reasonable rhetoric that arrived via e-mail today through the Minnehaha County GOP by local tea party animator Dr Allen Unruh. I cannot vouch for the e-mail's authenticity so if it's a hoax, I have fallen for it. Hard. Confirmation from the county GOP on the authorship of the e-mail has been requested. Highlights follow. Full text at the end. "Karl Marx said, 'First you socialize medicine and everything else follows like night follows day.' Socialized medicine is the last nail in the coffin of capitalism. Capitalism is the unequal distribution of blessings. Socialism is the equal distribution of misery. All health care decisions will be made by nameless, facelsss, heartless bureaucrats." "In times of economic and moral crisis, silence is not golden, IT'S YELLOW! Our forefathers pledged their lives, their fortunes, the sacred honor, because they would rather LIVE FREE OR DIE. Too many don't want to even take a few hours off work, or off their free time for the cause of freedom. Apathy, ignorance and indifference pave the road to tyranny. We are only a few months away from losing our country if we don't draw a line in the sand and say, "Enough is Enough!" It's time to stand up and be counted." "The SDSMA supports the achievement of meaningful health system reform – health system changes that hold promise for improving the health status and quality of care delivered to patients and are achieved in a fiscally responsible manner in order to maintain a sustainable health care delivery system." "A PARADIGM SHIFT IS NEEDED: A broad transformational change – a paradigm shift—is needed, away from our current health delivery system which is largely oriented to provide care for those who have already become seriously ill, and toward a more progressive system that focuses primarily on comprehensive wellness care and disease prevention." Thank you Dr Unruh for revealing to me the truth about your tea parties. The teapartysd.com movement is sponsoring a rally with national and international speakers this July 2nd, at the Sioux Falls Fair Grounds. Karl Marx said, "First you socialize medicine and everything else follows like night follows day." Socialized medicine is the last nail in the coffin of capitalism. Capitalism is the unequal distribution of blessings. Socialism is the equal distribution of misery. All health care decisions will be made by nameless, facelsss, heartless bureaucrats. Socialized medicine is one issue that can never be reversed. Frank Luntz, author of "Words that Work." said if there is enough public outcry, this is one issue that could be stopped. But it's only if enough people care enough about their country to protest. Talk show hosts can only do so much. We live in a bottom up system. Of the people, By the people, and For the people. The Declaration of Independence says, "Whenever any government becomes destructive of these ends (our inalienable rights) it is the right of the people to alter or abolish it. Please read the enclosed brochure, share it with all your friends, neighbors, and co-workers,. The penalty of the early colonists for their protest on a 3% tax on TEA, was death. What we have endured has made King George look like a PIKER. In times of economic and moral crisis, silence is not golden, IT'S YELLOW! Our forefathers pledged their lives, their fortunes, the sacred honor, because they would rather LIVE FREE OR DIE. Too many don't want to even take a few hours off work, or off their free time for the cause of freedom. Apathy, ignorance and indifference pave the road to tyranny. We are only a few months away from losing our country if we don't draw a line in the sand and say, "Enough is Enough!" It's time to stand up and be counted. I started the day thinking how much I like it that "I gotta go to work" equates to "I'm going for a bike ride." The day only got better. Start down there at the bottom left. Go to the bank for a FAB deposit. Head north to meet Craig to co-sign a FAB check to the Health Department for FABRAD food service license. Head east while coordinating via text message an August trip to MPLS. Between The Pastor, and another pastor and KT we've got it booked. Take a call from The Dad. He's somewhere on the east side of the city thinking he saw me stranded with a broken bike. Noap. I'm west side and doing fine. Head into downtown with Mama's Ladas on the brain. I note I'm sharing the Main Street sharrow with another rider. A red light gives me a moment for clarity. I'm sharing with The Dad. He's two blocks ahead with green lights as far as I can see. Hi The Dad! Mama's Ladas takes precedence, besides I doubt a catch was in the cards. How many miles is that for the year for you? Mama's Ladas, where all they want to know when you order is beef or chicken - and I didn't even have to go to that effort. They brought me my chicken, chips, Sprite and water. Now south to Staples to pick up the FABRAD ads to deliver tomorrow to the Beresford 125k for packet stuffing and ride time display. I love Staples Print/Copy center. I placed the order at 3pm, it was ready by 5:30. ...where I met with a few singletrack builders. We set some goals. Meet The City in two weeks to get approval of the neighborhood presentation. Present to the neighborhood by the end of the month. While there Tez arrived and delivered me some FAB registrations, FABRAD registrations and some jersey orders. Guess I gotta go for another bike ride to the bank. I don't think she noticed that I tried to stay dainty smelling for her. Finally, the recreational portion of the evening. Follow Snakebite back downtown and take the MUP the long way home. I think I'm just a couple tasks short of being able to say I'm too busy to ride. Just kidding...I really don't make any effort to smell dainty for the ladies.